Having hard time choosing your next glasses/sunglasses? Want to check out how you would look in glasses? Now you don't have to visit various glass shops to try on all different glasses till you find your favorites. 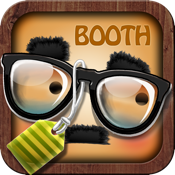 Download Pimp My Glasses and you will have hundreds of different glasses to try on instantly at your fingertips. From funny-looking sunglasses to standard geeky-looking black glasses, Pimp My Glasses has all different types of glasses you can try on. Simply take a self shot, or browse your picture from your Photo Library and add your favourite glasses onto your picture. You can inscribe your words on top of the result and share it with the world via email, Facebook and Twitter with a touch of a button. Works with photos taken with iPhone/iPad Camera or browsed from your photo library. Choose from hundreds of various pairs of glasses. Upload the Result on your Facebook / Twitter. Make your Personal Postcard/Letters/Pictures using AirPrint. Send 'Picture Email' to your friends and families. Save results to Your Device.